The good news is that heartworm infection is easy to protect against; the bad news is only 59% of dog owners and less than 5% of cat owners protect their pets by giving them a heartworm preventative! Considering that heartworm disease has been reported in all 50 states, these percentages mean that not all pets that are at risk of infection are protected. Because heartworms are transmitted by mosquitoes, the majority of cases occur along the Atlantic and Gulf coasts and in the Mississippi, Missouri and Tennessee River valleys. However, all available evidence suggests that the disease is spreading throughout the United States, moving north and west. Heartworm infection is starting to appear with greater frequency in many regions where it was previously uncommon or unknown. This is why we want to stress the importance of keeping your pet protected against this potentially deadly disease. Heartworm infection takes place when a mosquito carrying microscopic heartworm larvae (immature worm) bites a susceptible animal such as a dog or cat. The larvae then enter a blood vessel in the pet and are carried to the arteries in the lungs, where they cause inflammation. Worms can die at any stage in their life cycle, causing even more inflammation as well as potentially serious complications, particularly in cats. The worms that progress to the adult stage may live undetected for a number of years. But when the adult worms die, they cause inflammation in the heart or lungs that can be severe enough to cause the pet's death. Heartworm infections in dogs differ greatly from those in cats. The dog is a natural host for this parasite, but the cat is not. Because of this, cats usually have fewer worms and a purportedly lower rate of infection. A dog may harbor 50 to 100 worms, but a recent study on feline heartworm disease from Auburn University found only an average of four worms per cat. Yet the feline body's response is so severe that even these few worms can cause significant damage. In fact, heartworm infection in both cats and dogs can be life threatening. The signs of heartworm disease vary from pet to pet. Dogs may cough, have difficulty breathing and wear out quickly (referred to as exercise intolerance). In cats, the most common signs are coughing, difficulty breathing and vomiting, but they can also include blindness, convulsions, diarrhea, fainting, and loss of appetite or weight. The signs of feline heartworm disease are often mistaken for feline asthma, allergic bronchitis, or other respiratory diseases, which means that cats with heartworm disease may be misdiagnosed. And both dogs and cats may not exhibit any signs of the disease, which is scary when you consider that heartworm infection can cause sudden death. Heartworm preventatives are the best way to keep your pet free of heartworms. Preventatives work by killing heartworm larvae that infected your pet in the prior 30 days, before the larvae have the opportunity to develop into adults. These products also protect against some intestinal parasites. Some products even have activity against fleas and ear mites. A variety of options are available for preventing heartworm infection, including monthly tablets and chewables and monthly topicals. All these products are extremely effective. When they are administered properly and on a timely schedule, they can completely prevent heartworm infection. Heartworm prevention is safe, easy and inexpensive. In addition, there is no approved treatment for heartworm infection in cats. The American Heartworm Society and Companion Animal Parasite Council recommend year-round prevention, even where mosquitoes are seasonal. This recommendation makes sense considering that these preventatives also protect against the aforementioned intestinal parasites, which are not seasonal and infect millions of cats and people each year. While this number is alarming, it is not a reason to get rid of the family cat. You can protect your entire family by giving your cat a monthly broad based spectrum heartworm preventative. Speak with us today about a preventative plan that is best for you and your cat. Many people do not realize that cats can get heartworm disease. 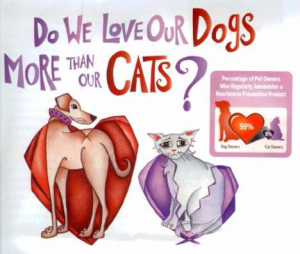 With more dog owners than cat owners protecting their pets with a heartworm preventative, it might raise the question: Do we love our dogs more than our cats? We don't believe that we do. We think cat owners just need to learn about the risks heartworms pose to their pets, so we'd like to share our top five myths about feline heartworms. Myth #1: It only affects dogs. Heartworm disease is not just a canine disease. Cats are getting heartworm far more often than we previously believed. A yearlong study conducted in the Gulf Coast area found that 26% of the cats had been infected with heartworm larvae at some point in their lives, and found adult heartworms in 10% of the cats. Compare this with the feline leukemia virus (FelV) incidence of 5% and feline immunodeficiency virus (FIV) incidence of 6%, and you can see that feline heartworm is much more widespread. Myth #2: It only affects outdoor cats. Indoor cats are not impervious to heartworm infection. A North Carolina study found that 27% of cats diagnosed with heartworm were indoor-only cats. It only takes one mosquito to cause an infection, and because mosquitoes can get indoors, both indoor and outdoor cats are at risk. Myth #3: It's a heart disease. The name "heartworm disease" is a misnomer for cats, as it mostly affects their lungs, not their heart. Because cats are unique in their respiratory reaction to heartworms, a new title has been given to this particular set of symptoms: heartworm- associated respiratory disease, or HARD. Cats that suffer from HARD can have difficulty breathing and can die from the disease. However, even in the late stages, afflicted animals often exhibit no symptoms. Myth #4: Only adult heartworms cause problems. 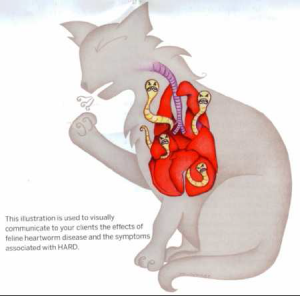 Unlike dogs, cats do not need an adult heartworm to exhibit clinical signs; in fact larvae are a main cause of the problems. Studies show that 50% of cats infected with heartworm larvae have significant damage of the small arteries that supply blood to the lungs. Most larvae in cats never make it to the adult stage, and the Auburn University study found that dead, decomposing worms can cause major damage to the lung tissue, which can lead to airway disease. Myth #5: It's easy to test for. Diagnosis is much more difficult for cats than it is for dogs, and current testing practices miss many feline infections. If your cat is exhibiting signs of heartworm disease (e.g., coughing, difficulty breathing, vomiting), talk to your veterinarian.